Spring is here! Which means baseball, soccer, festivals, concerts and all reasons to get outside and enjoy our epic weather. So why not take to your own backyard for some fun and relaxation with your family and friends. Our Florida yards are an extension of our homes. 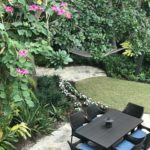 Imagine enjoying your morning cup of coffee at a café table on your patio surrounded by new flowers and lush plantings. Picture watching the kids run and play on your gorgeous lawn, having cocktails in your own tropical oasis, or grilling out and enjoying a fabulous al fresco dinner under the stars. We help our clients maximize their outdoor areas so they can expand their beautiful and functional living spaces as an extension of their home. Tommy Todd Landscape and Design can transform your yard and give you that retreat you have always wanted. If spring cleaning is all you need, then let us re mulch, revitalize your flower beds and allow your space to feel new again. Spring is a time for home renovations, new flowerbeds, and new beginnings. No matter whether the job is big or small, let Tommy Todd Landscape & Design help you kick off a project to match this gorgeous weather.